Paul Draper delivered the Plantinga lecture last October. The lecture was effectively a sneak preview of his forthcoming book the Evidential Problem of Evil (according to his webpage). The text of the lecture has been made available online and I wanted to go through it over the next few posts. As with all of his work, Draper’s lecture is both thoughtful and thought-provoking. It is also, on the face of it, quite humorous in places. Of course, it’s difficult to say how these things go over in person as opposed to on the page, but I can certainly say that some of the philosophical in-jokes elicited a wry smile from me as I read them. Anyway, down to business. Draper’s lecture is entitled “God and Evil: A Philosophical Inquiry”. Unsurprisingly, it presents a basic argument against theism by focusing on a particular datapoint relating to evil. To support this argument, heavy use is made of an analogy drawn from a classic scientific dispute over the nature of light. In this first part, I’ll outline the analogy, I’ll present Draper’s basic argument, and address some of the terminology he uses. The analogy brings us back to the early 19th Century and a debate about the nature of light. At the time, there were two dominant schools of thought on the issue. According to one of these schools, light was a wave (call the relevant theory “wave-ism”); according to the other school, light was a stream of particles (call the relevant theory “particle-ism”). Neither theory seemed to have a decisive advantage over the other with respect to the data at the time. All that was about to change. In 1818, a young scientist named Fresnel submitted work on wave diffraction to the French Academy of Sciences as part of a competition. Diffraction is what happens to a wave when it encounters an obstacle. 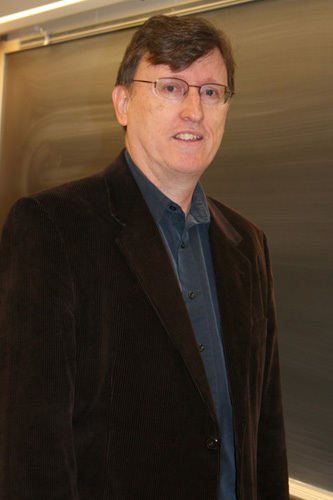 One of the judges in the competition, Poisson, realised that Fresnel’s work could be used to confirm particle-ism over wave-ism was true (Poisson was a believer in particle-ism). Poisson deduced that if a light was shone at a circular disc, then, if the wave theory were true, one would expect to see a single spot of light in the middle of the shadow cast by the disc. If the wave theory was false (as Poisson thought) no such spot should be visible. As fate would have it, the experiment actually confirmed the existence of the spot. The experiment is illustrated below. Without getting too embroiled in the details, there are three important points arising from this story. First, there are two competing theories that seem, relative to one set of data, roughly equally probable (wave-ism and particle-ism). Second, there is a particular datapoint that seems to confirm one theory over another (the presence of Poisson’s spot). And third, there is the apparently reasonable conclusion that, as a result, wave-ism is more likely to be true than particle-ism. The three features just alluded to are crucial to understanding why Draper discusses the example. His argument against theism, although certainly more complex, turns on a very similar pattern of reasoning. Once again we have two theories (naturalism, theism) which are symmetrical with respect to one set of data; we have a particular datapoint (existence of evil) which seems to confirm naturalism over theism; and we have the seemingly reasonable conclusion that naturalism is therefore more likely to be true than theism. There are also some differences between the two cases that come to the fore in Draper’s subsequent analysis. 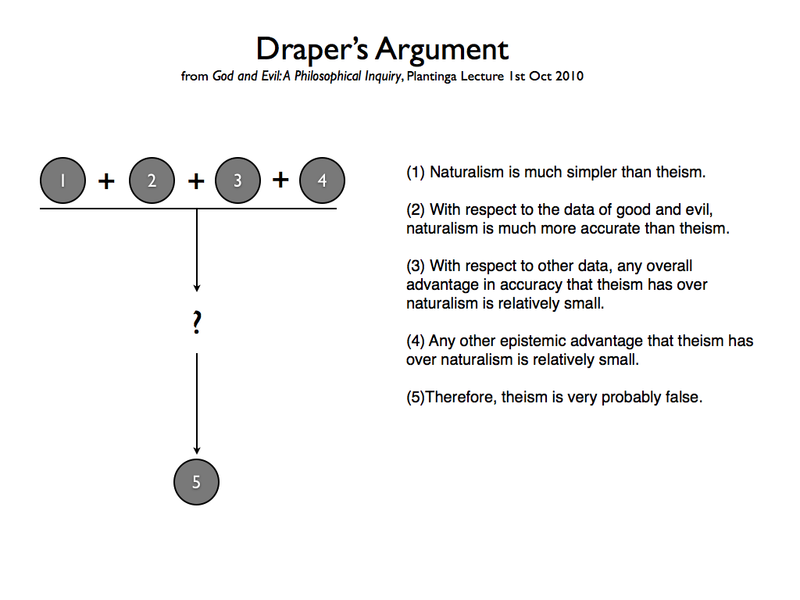 Two differences seem worthy of mention at the outset: (i) Draper claims that naturalism is simpler than theism and thus has higher a priori probability; and (ii) it’s much more difficult to assess the respective merits of theism and naturalism. (1) Naturalism is much simpler than theism. (2) With respect to the data of good and evil, naturalism is much more accurate than theism. (3) With respect to other data, any overall advantage in accuracy that theism has over naturalism is relatively small. (4) Any other epistemic advantage that theism has over naturalism is relatively small. (5)Therefore, theism is very probably false. This is illustrated below. As you can see, I’ve placed a gap between the premises and the conclusion. This is because, as Draper acknowledges at the end of his lecture, the inference is not as straightforward as you might think. Obviously, to make this argument in any way compelling, Draper needs to support each of its premises. Unfortunately, he doesn’t do all the necessary work in his lecture, he saves that for his forthcoming book. But he does sketch defences for (1) and (2) and offer some comment on (3) and (4). We’ll go through these in the subsequent posts. Naturalism: The view that the public, objective, physical world has ontological priority over the private, mental, subjective world. In other words, the view that the mental can be explained in terms of the physical. Supernaturalism: The view that the private, mental, subjective world has ontological priority over the public, objective, physical world. In other words, the view that the physical can be explained in terms of the mental. In practice, this means that the physical world was created or brought about in order to fulfill or satisfy the purposes of one or many mental entities. Theism: A sub-type of supernaturalism according to which the physical world was brought into being by a single, omnipotent, omniscient, and omnibenevolent mental entity. Note here that theism is defined as a specific type of supernaturalism that makes specific claims about the type of mental entity responsible for the creation of the physical world. This turns out to be significant later in Draper’s argument. It is probably worth asking at this stage whether there are more specific versions of naturalism too. Presumably there are (e.g. single-universe vs. multiverse theories). This might be significant as well. Anyway, that’s it for now. In the next part, I’ll look at Draper’s defence of premise (1) and (2). I take it, then, that according to Draper werewolves would be natural? As would be symbols of power? I won't pretend that there is a single definition of "natural" that captures all its meanings. But I think the most useful definition is "uniformity" - things are natural to the extent that they are "like" other things, to the extent that they are not subject to special rules. In particular, supernaturalism is typically connected with great irregularities at the level of humans or persons: werewolves aren't harmed by lead bullets, like everything else is; symbols of power affect the (otherwise normal, i.e. "natural") physical world; and yes, of course, souls animate those rare human bodies. This is the most useful definition because it captures the heart of naturalism in practice - the naturalistic explanations are always based on a uniformity, where things work "just like" other things. Planets move just like rocks, biology works just like chemistry... it's all about uniformity. My objection is related to my panpsychic [experientist] tendencies. When you think the public, objective, physical world and the subjective, mental, private world are the same world, Draper's definition loses meaning. But naturalism is still very different from theism. Draper does actually discuss panpsychism in his paper. I just left it out since it didn't seem crucial to the overall argument.